Everything you need in one place, large full service sites, free WIFI, 30/50 amp services, recreation hall, games night, showers and toilets. we’re your go-to RV park for all that Quartzsite has to offer. Hassler’s RV Park is now under new ownership and we are thrilled to take over the running of this wonderful RV park and it’s world famous “Home of the Mechanical Zoo”. There will be big changes coming to the park, but we will be maintaining it’s funky uniqueness. Hassler’s RV Park is centrally located and is driving, walking or biking distance to Quartzsite’s Annual Rock & Gem Show, The Quartzsite Sports, Vacation & RV Show, Tyson Wells Market Center Swap Meet, local Food Marts, Hair Salons, Silly Al’s Pizza, Hi Jolly Monument and the many ATV recreational areas of Quartzsite. With our competitive daily, weekly and monthly rates, friendly staff and over sized RV sites, it’s no wonder we’re already booked into next year! Give us a call and we’ll save you a spot! For Your Next RV Getaway! New owners, new attitude! With over 130 full service oversized sites to choose from,we’re sure to find you a place to call home. Hassler’s RV Park is a hassle free, active adult oriented park with lots of distractions to fill your days. We offer the best daily, weekly and monthly rates in town! So you can sit back and meet your neighbours, go for a walk, play some desert golf or take the UTV out for a bit of off road exploring, the choice is yours. We provide all the comforts of home, including a recreation hall for cards, music and games, laundry-mat, showers, toilets, WIFI, full service sites and nearby shopping. Our on site hosts are friendly, informative and willing to go that extra mile. Whether you need quarters for the laundry, the location to nearest grocery store, post office, bank or medical clinic or the secret ingredients in Linda’s famous pea soup, Harley and Linda are always there to help. 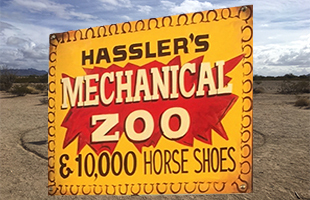 Over 10,000 horseshoe and nails were used to build and design our world famous Mechanical Zoo. Each sculpture was built from old race track horse shoes, nails and odds and ends. A must see when visiting Quartzsite Arizona. Panoramic vistas, spectacular sunrises and sunsets, abandoned mines, coyotes, road runners, cactus blooming after a rain, Quartzsite is a photographers dream location. Just a few steps off of West Main street and you’ll be lost in the desert beauty, vast blue skylines and incredible wildlife in no time. Quartzsite is the quintessential location for all your favorite outdoor activities. Whether its desert golf, gold panning, hiking, biking, shopping for treasures, photography, or experiencing the ultimate in off-road adventures, Quartzsite, Arizona has got it all. If you’re craving for a slice of pizza and a cold one or perhaps a turn around the dance floor then look no further then across the street. Silly Al’s has been a family run business since 1987. Your pizza is hand tossed and made fresh. Their “Goliath” pizza is a whopping 20″! Welcome to Hassler’s RV Park News and Events page. Here you will find current news, events and frequently asked questions. If there is something going on in the park you’ll find all you need to know here. Our park hosts Harley and Linda are here to help!